DUE to popular demand, the Enfield Revue Society has decided to put on a fourth performance of their show, which makes a comeback later this month after a three-year absence. The show will now run from Tuesday, 27th February to Friday, 2nd March in the Hamlet Court Hotel, Johnstownbridge at 8pm sharp. With just three weeks to go to opening night, the Enfield Revue cast has been at rehearsal after rehearsal for their variety show , which promises to have something for everyone. The finishing touches are being put to costumes so the chorus line look their best and the enthusiastic dancers are all set to dazzle the audience with their dances routines. Hilary Maye, Enfield Revue Society PRO said: “With the full support of hotel owner John O’Neill and his staff at the Hamlet Court Hotel, all stops are out so the venue looks its best on the night. Facilitating the public is something John takes in his stride and he has offered to help in whatever way he can to make Enfield Revue’s comeback a success”. With positive feedback from the public, the committee decided to add the fourth date to the show’s run. 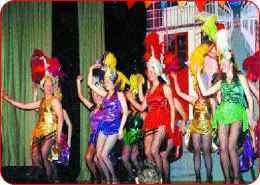 The chorus line for Revue 2007 includes Laura Digan, Claire and Maeabh O’Callaghan, Lee Van Rooney, Rebecca Dempsey, Jane and Sara Alford, Erica Byrne, Alison Daniel, Coleen Byrne, Dean Henrick and John O’Lane. Familiar names are back in the comedy - Carol McDonnell, Kenny Davy, Anthony Gorry, John and Damien Heffernan, John Conway and Alan Ryan, and with Eamon O’Connor both a comedy team member and solo artists, his talents are sure not to disappoint. The last fundraising event before the show gets under way comes in the form of a table quiz in the Bridge House on February 8th in the Bridge House, Enfield, at 8.30pm. Your support for this event would be very much appreciated. The committee is most grateful to the Bridge House, Enfield for the use of their meeting room and to the Hamlet Court Hotel for the use of their facility for rehearsals. Tickets for the show are on sale each night at the door. Adults e10, Children e8, group rates available. Family ticket e30 and admits one child and three adults or two children and two adults. The show takes place on 27th, 28th February, 1st, 2nd March in the Hamlet Court Hotel, Johnstownbridge, at 8pm.